My 1964 Thompson Thomboy was restored by Richard Zinn, formerly of East Lansing, MI. It was a painstaking, two-year process, after which he and his wife enjoyed it on Lake Lansing for three years. Not long enough! 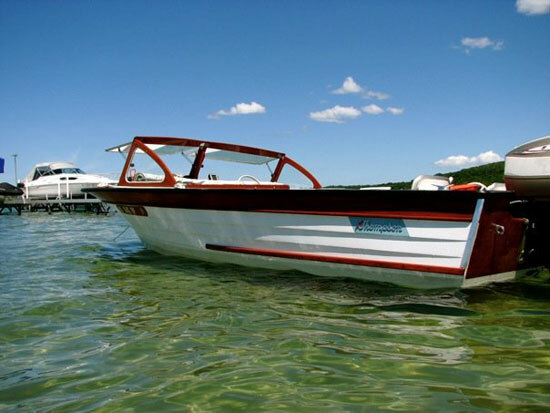 The interior is original, as is the 90-hp Evinrude that came with it in 1964—manufactured in the same year that I was! I was fortunate enough to find it online, after a 3-year search for the perfect Thompson. Growing up in West Michigan, my dad had two Thompsons, so when it came time to find one for my family, I knew what I was looking for. 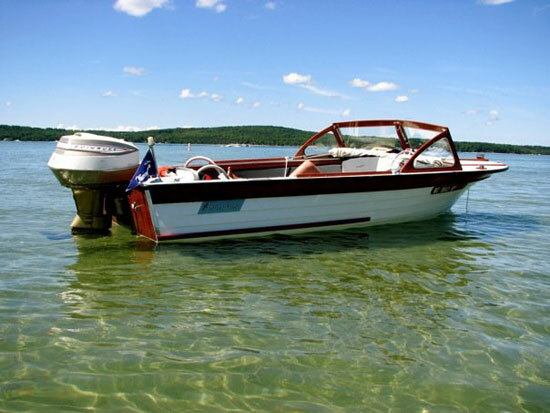 My wife, myself and our four kids enjoy using it on vacation on Lake Charlevoix, in Murray Lake in Lowell, and up on Hardy Pond in Newaygo MI. We’re just starting to use the old girl, searching out the perfect inland lakes to explore. Thanks to Thompson Dockside and Andreas Rhude for some great help and advice through the process. The Thompson Dockside and this Website are independent entities and are not affliliated with Thompson Boats. The opinions expressed are solely those of the publisher. © 2011 The Thompson Dockside. All Rights Reserved.